Head to SeatGeek.com to get 2011 NHL Playoffs tickets! And learn how to find the lowest Stanley Cup Ticket prices. The first round of the 2011 NHL Stanley Cup Playoffs is over and that means that only 8 teams are left to battle it out for that elusive chance to hoist Lord Stanley’s Cup. The first round didn’t go silently into the night though. Anybody who has been fortunate enough to secure NHL Playoffs tickets so far this year will tell you the same. Round one was filled with memorable moments and story lines that couldn’t have even been close to scripted. An NHL playoffs record was set with at least one game going into overtime for eight nights in a row. There were also unlikely comebacks with San Jose erasing a four goal deficit to beat the Kings and the Capitals coming back from thee down in the third period against the NY Rangers to force extra time and eventually win in the second OT. Oh, and who could forget Bobby Ryan’s miraculous goal against Nashville that some are calling the best of the playoffs so far this year. If this is any indicator, then in the second round it might be tough to get NHL Stanley Cup playoff tickets. However, even if games are sold out you can always head over to SeatGeek.com to get your 2011 NHL Playoffs tickets. In the West there’s match ups pitting the San Jose Sharks vs. the Detroit Red Wings and the Vancouver Canucks vs. the Nashville Predators. Out East the two series include the Boston Bruins vs. the Philadelphia Flyers and The Washington Capitals vs. the Tampa Bay Lightning. Already there are some story lines being created. Two of the league’s top goal scorers in Alexander Ovechkin and Steven Stamkos are going head to head, recent powerhouses Detroit and San Jose are battling, the Predator’s are trying to prove they belong in their first appearance past the first round in franchise history, and Boston is trying to knock off last years Eastern Conference champion. So which Stanley Cup playoff ticket costs are ranking the highest for fans so far? We are using our Seatgeek NHL ticket price data to look at the most demanded opening games of the second round. As you can see the match up with the highest priced game one is the Wednesday night game between the Vancouver Canucks and the Nashville Predators. Vancouver is coming off a season that was good enough to earn them the President’s Trophy for the highest point total and they are looking to carry some of that steam into the playoffs. 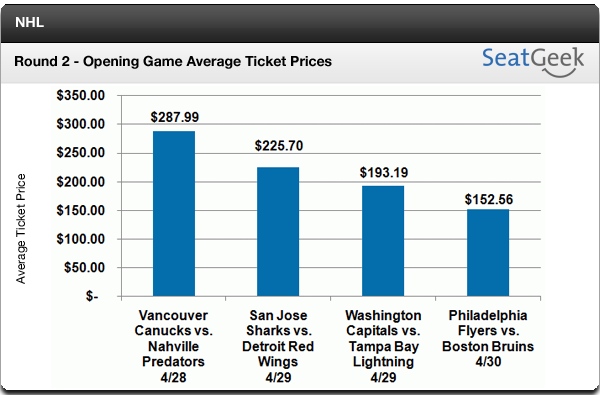 A bit of a surprise is the lowest average ticket price for the Bruins and Flyers series. The Bruins are an original six team and the Flyers made it to the Stanley Cup Finals last year. Therefore, it might be a good time to get in to these games while the tickets seem to be relatively cheap for the match up. We can only hope that for the second round the initial Stanley Cup Playoffs tickets cost is worth the excitement these games will bring. Be sure to head over to SeatGeek.com and pick up your 2011 Stanley Cup playoffs tickets today to make sure you catch more of the action from this years playoffs.